The culture of cross-dressing is seen throughout history, across different countries from the East to the West. In Japan, the story of Yamato Takeru dressing as a woman to conquer the enemy from Kojiki (Records of Ancient Matters) is famous. Such customs have been prevalent for a long time, as we can see in the example of Chigo (child of festivity) in the Middle Ages and entertainment performers. They are also seen in the Edo period, such as geisha in men’s clothes performing at festivals and male kabuki actors specializing in playing female roles. 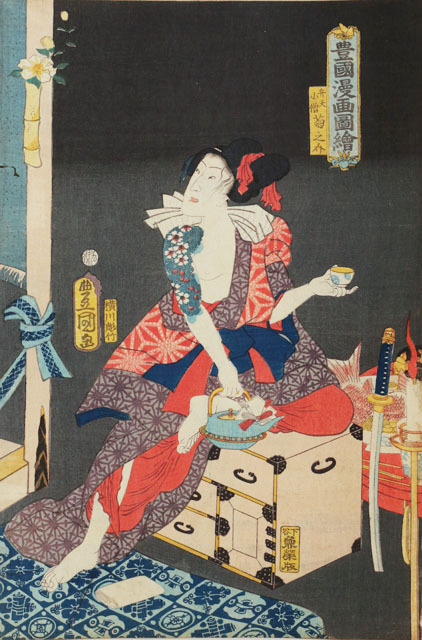 Benten the Thief, a cross-dresser thief in kabuki shows how cross-dressing characters on stage have been widely known to the public. The idea of switching male and female, reminds us of the recent hit movie “Your Name”. However, history tells us that people were familiar with the concept of cross-dressing and switching genders since the Edo period. 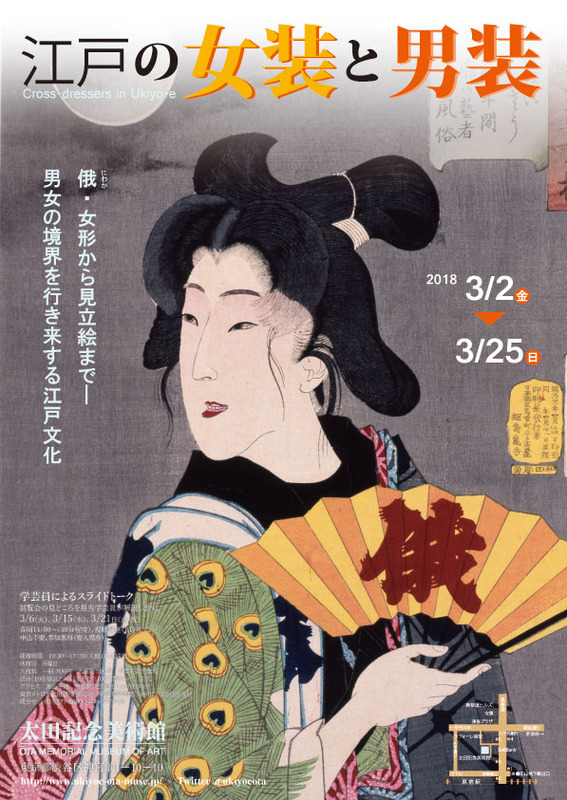 Through ukiyo-e pictures, this exhibition will present the various customs and cultures in the Edo period which flow freely beyond boundaries of male and female. In Yoshiwara, the pleasure quarter in the Edo period, a festival called Niwaka was held in August. Geishas dressed in men’s clothes performed lion dances and impromptu skits on the main street, Nakano-chō . They brought excitement to the festival by dressing up as black kites or performing a famous play called Sukeroku. These customs were seen in festivals in various places, including Sannō Festival and Kanda Festival. In Japan, there are ancient stories of cross-dressing, including that from Kojiki (Records of Ancient Matters) of Yamato Takeru dressed as a woman to conquer the enemy, and that of Ushiwakamaru fighting against Benkei as a cross-dressing boy. 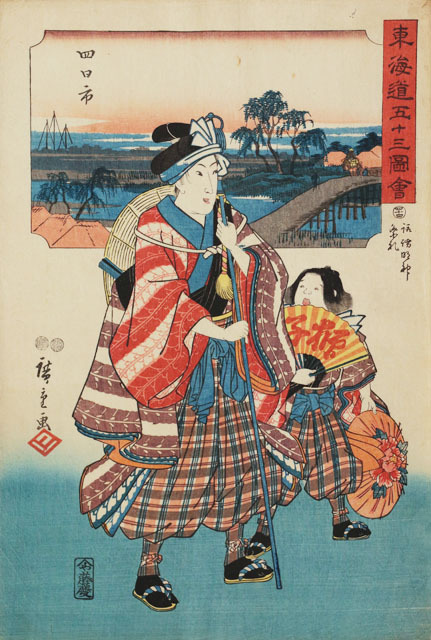 In the Edo period, Benten, the thief from a kabuki play who crossed-dressed as a woman, and Inusaka Keno, the swordsman dressed as a woman from “Nansō Satomi Hakkenden” （The Story of Eight Samurai), grew in popularity. In this section, we introduce cross-dressers who appear in stories. It seems to have been that in the troupe of Izumo-no Okuni, which founded kabuki, women including Okuni, cross-dressed to play male characters, and men cross-dressed to play female characters. 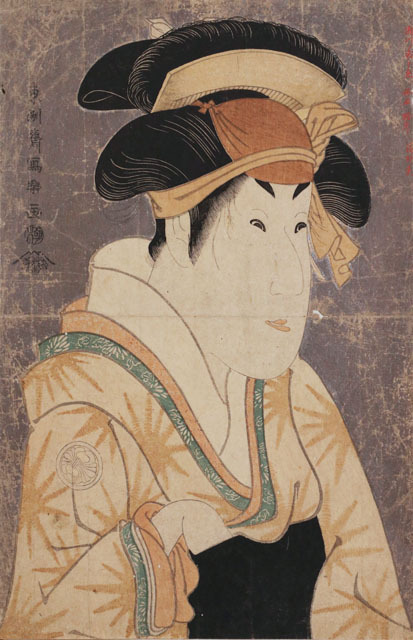 After women were prohibited from playing kabuki in 1629, some male actors specialized in playing female roles and many great cross-dressing actors appeared in kabuki scenes. The actors of female roles were encouraged to live their daily lives as women as well. They were the specialists of cross-dressing. In kabuki plays such as “Onna-sukeroku” and “Onna-seigen”, there is a custom of switching male characters to female characters. Also, many “parody pictures” in ukiyo-e switch the genders of historical and fictional characters and draw them as fashionable persons. 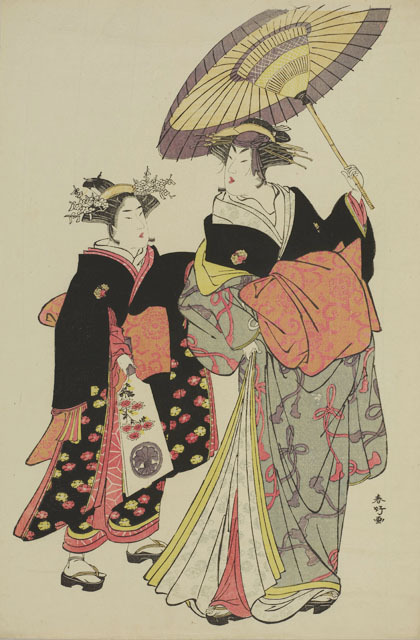 In this section we introduce the stylish cross-dressing that common people enjoyed during the Edo period. 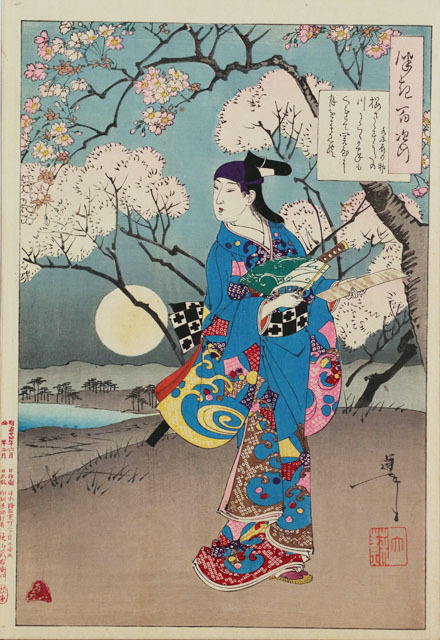 “Thirty-two Aspects of Women” is a set of 32 pictures of beautiful women that Tsukioka Yoshitoshi produced in his later years. They are based on themes such as “looking cold” or “looking painful”, of women of various ages and occupations. This particular picture expresses “looking suitable”. What makes it “looking suitable”? 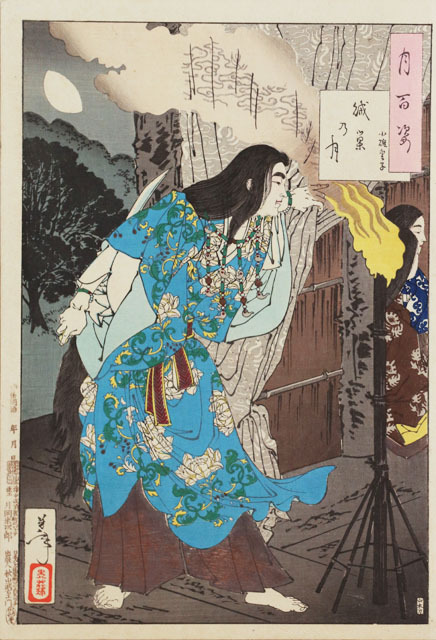 According to the explanation in this picture, the person depicted was a geisha at the brothel from 1844 to 1848. 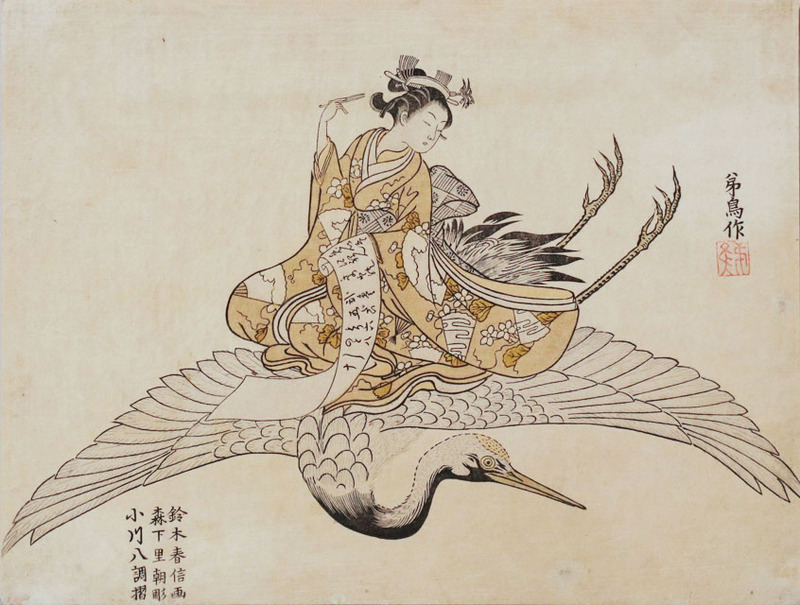 The female geisha who participated the festival in Yoshiwara called Niwaka in August, is dressed up as a black kite called Tekomai. 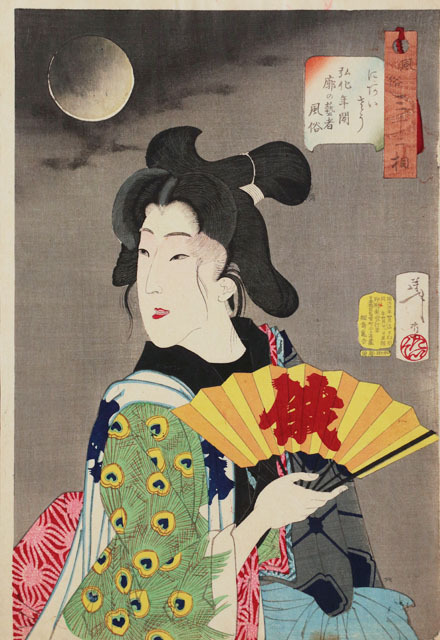 She is drawn as wearing men’s clothes with a men’s hairstyle, holding a fan marked “Niwaka”. Since this cross-dressed female geisha is looking well and dignified, it must be the reason why this picture is titled “looking suitable”.